This article originally appeared as an Op-ed in the New York Times. Increasing evidence suggests that the alarming rise in allergic and autoimmune disorders during the past few decades is at least partly attributable to our lack of exposure to microorganisms that once covered our food and us. As nature’s blanket, the potentially pathogenic and benign microorganisms associated with the dirt that once covered every aspect of our preindustrial day guaranteed a time-honored co-evolutionary process that established “normal” background levels and kept our bodies from overreacting to foreign bodies. This research suggests that reintroducing some of the organisms from the mud and water of our natural world would help avoid an overreaction of an otherwise healthy immune response that results in such chronic diseases as Type 1 diabetes, inflammatory bowel disease, multiple sclerosis and a host of allergic disorders. In a world of hand sanitizer and wet wipes (not to mention double tall skinny soy vanilla lattes), we can scarcely imagine the preindustrial lifestyle that resulted in the daily intake of trillions of helpful organisms. For nearly all of human history, this began with maternal transmission of beneficial microbes during passage through the birth canal — mother to child. However, the alarming increase in the rate of Caesarean section births means a potential loss of microbiota from one generation to the next. And for most of us in the industrialized world, the microbial cleansing continues throughout life. Nature’s dirt floor has been replaced by tile; our once soiled and sooted bodies and clothes are cleaned almost daily; our muddy water is filtered and treated; our rotting and fermenting food has been chilled; and the cowshed has been neatly tucked out of sight. While these improvements in hygiene and sanitation deserve applause, they have inadvertently given rise to a set of truly human-made diseases. While comforting to the germ-phobic public, the too-shiny produce and triple-washed and bagged leafy greens in our local grocery aisle are hardly recognized by our immune system as food. The immune system is essentially a sensory mechanism for recognizing microbial challenges from the environment. Just as your tongue and nose are used to sense suitability for consumption, your immune system has receptors for sampling the environment, rigorous mechanisms for dealing with friend or foe, and a memory. Your immune system even has the capacity to learn. 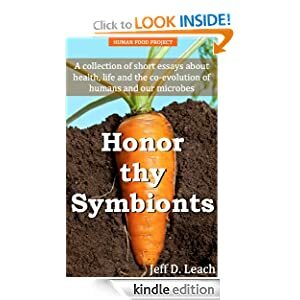 For all of human history, this learning was driven by our near-continuous exposure from birth and throughout life to organisms as diverse as mycobacteria from soil and food; helminth, or worm parasites, from just about everywhere you turned; and daily recognition and challenges from our very own bacteria. Our ability to regulate our allergic and inflammatory responses to these co-evolved companions is further compromised by imbalances in the gut microbiota from overzealous use of antibiotics (especially in early childhood) and modern dietary choices. The suggestion that we embrace some “old friends” does not immediately imply that we are inviting more food-borne illness — quite the contrary. Setting aside for the moment the fact that we have the safest food supply in human history, the Food and Drug Administration, the Centers for Disease Control and Prevention, and food processing plants and farmers continue to take the blame for the tainted food that makes us ill, while our own all-American sick gut may deserve some blame as well. While the news media and litigators have our attention focused on farm-to-table food safety and disease surveillance, the biological question of why we got sick is all but ignored. And by asking why an individual’s natural defenses failed, we insert personal responsibility into our national food safety strategy and draw attention to the much larger public health crisis, of which illness from food-borne pathogens is but a symptom of our minimally challenged and thus overreactive immune system. As humans have evolved, so, too, have our diseases. Autoimmune disease affects an estimated 50 million people at an annual cost of more than $100 billion. And the suffering and monetary costs are sure to grow. Maybe it’s time we talk more about human ecology when we speak of the broader environmental and ecological concerns of the day. The destruction of our inner ecosystem surely deserves more attention as global populations run gut-first into the buzz saw of globalization and its microbial scrubbing diet. But more important, we should seriously consider making evolutionary biology a basic science for medicine, or making its core principles compulsory in secondary education. Currently they are not. As we move deeper into a “postmodern” era of squeaky-clean food and hand sanitizers at every turn, we should probably hug our local farmers’ markets a little tighter. They may represent our only connection with some “old friends” we cannot afford to ignore. Previous Post Do spider monkeys hold the key to why we get fat? I recently posted a question on a previous HFP article on whether supplying inulin rich foods are feeding just the bifidobacterium or are other pathogenic microbes also fed? I never received any kind of response. Any thoughts? Oh how I wish this was true in ALL the cases (let’s say in my case). I was exposed to bugs of all kind all of my childhood – cow poo and all. My father was too. I would often forget to wash my hands and ate the fruits and berries straight from the tree / garden. Neither of us subscribed to a hand-sanitizer craze. Thx for sharing. That’s a tough one. My mom was an advocate of dirt, but I think it had too much Aldrin or Deldrin in it. Excessive antibiotics and processed foods finished the job. My kids and I have no Bifidus and not much Acidophilus. No amount of oral probiotics has changed that. Arthritis, severe allergies…etc. I purchased some dirt (humic acid to replenish soil)and am putting a scant amount in my morning coffee. think this is helping my gut?